During Biblical times and throughout history, people learned stories about the “eighth plague of locust” that took place in preparation for the Exodus—a departure of the promised people (Hebrews or Israelites) from Egypt. The Pharaoh refused to liberate the children of Israel and agents of God, Moses and Aaron both, warned him that God would punish him and his people as a consequence. As soon as Moses left the palace, he raised his arms toward heaven and by morning, riding in on an east wind, hordes of locusts swept into Egypt. They covered the sun and devoured everything green that had escaped the hail and previous plagues. Extremely frightening, these infestations created human famine and starvation. Even today, the most destructive phases of locust take place among sustenance farmers in Africa, where the “desert locust” is notorious. They can be found in other parts of the world including the Middle East, Asia and in up to sixty other countries. Locusts are related to grasshoppers and look quite alike. During certain times of the year, they fall into a “gregarious phase,” navigating together in huge swarms –sometimes 460 square miles (1,200 square kilometers) in size— eating eat plants and crops in a ravenous manner, earning them the apt name, “a natural disaster.” Each individual locust can eat its weight in plants each day. They can take lengthy treks across countries spreading their destruction. However, Cicadas are not locusts. There is a genus (a family name and type) of 17-year Periodical Cicada indigenous to eastern North America called “magicicada.” They live underground for 13-17 years, feeding on the fluids from the roots of deciduous forest trees. Then, like magic, mature cicada nymphs emerge from the ground, all at the same time and in great numbers called broods. The males will meet together in what are called chorus centers, make buzzing sounds and attract mates. Within two months’ time, eggs have been laid in tree twigs and tiny cicadas nymphs fall off the trees and are gone for another cycle, another 13 or 17 years. Brood V periodical cicadas will emerge in 2016 in parts of Ohio, Pennsylvania, Virginia, West Virginia, Maryland and Long Island, NY. That is why they are confused with locusts. What could cicadas possibly have to do with human eyes? 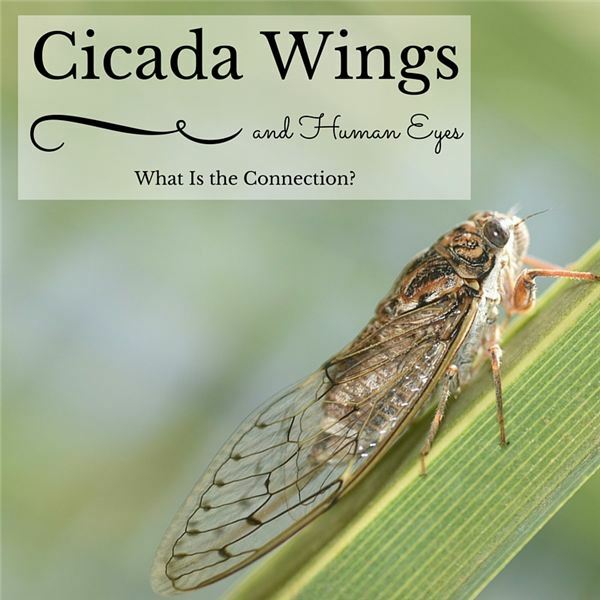 It’s amazing, but human eye cells have been successfully grown on the wings of cicadas! Huh? Nanoscientist and biophysicist Dr. Gregory Watson and his wife, Dr. Jolanta Watson, examine the natural world of the very, very small. While walking through the woods one day, they spotted a dead cicada and noticed that its wings did not reflect light. In addition, the wings of the cicada were not consumed or contaminated as the other parts of their bodies, which had died off and decomposed. That prompted them to take it back to the lab to study, because bacteria play a huge role in decomposition. Using an atomic force microscope, they found very little adhesion between the cicada wings and natural contaminants such as soil fragments and pollens. The wings appeared to be self-cleaning and bacteria were literally torn apart. Soil and other sediments just didn’t stick to the surface. Cicada wings are covered in rows of waxy cones. When it rains, the super-hydrophobic nature of cicada wings create droplets that hop or splash off and remove soil, dust, pollen and other microbes. Resistance to antibiotics is the great puzzle of public health and biomedical applications—meaning, science is always looking to find something that will minimize post-surgery infections. Now this was the first time scientists found a natural surface, rather than chemicals, to kill bacteria. Dr. Watson said they eventually had been able to grow human retinal cells successfully on the wings of the cicada. The retina is a layer of light-sensitive cells on the back of the eye that collect light and send them as electrical and chemical signals to the brain through the neural optic nerve. “This highlights the applications for these types of surfaces where we can kill bacteria but also have a surface which allows human and animal cells to grow. Such surfaces may find applications in human implants where there is a need to minimize post-surgery infections and promote wound healing,” he said. Unfortunately, when scientists introduced another staph bacterium to the surface later, the rod-shaped bacteria began to proliferate. Despite the cicada wing’s extraordinary bacteria-shredding capabilities, these wings failed now the ultimate test with staphylococcus aureus (golden staph), the most common and deadly of germs. When the staph was introduced to the surface, all of them survived. It was a great disappointment. Amongst the samples, Gregory had also included a dragonfly wing. Because of the different structure of dragonfly wings—random arrays of slightly different geometrical shapes—this new structure shred every type of bacteria including golden staph, a most dangerous and sometimes lethal antibiotic-resistant strain. They tested again and again. Anything they put in contact with the surface of the dragonfly wing was killed. One day we may thank the cicada and the dragonfly for making surgery safer. Gray, Susan H. The Eyes: The Human Body. Chanhassen, MN: The Child’s World, 2006. Pringle, Laurence. Cicadas! Strange and Wonderful. Honesdale, PA: Boyds Mill Press, 2010. Frost, Helen. Cicadas. Mankato, MN: Pebble Books, Capstone Press, 2001. Halvorson, Karin, M.D. Inside the Eyes. North Mankato, MN: ABDO Publishing Company, 2013.